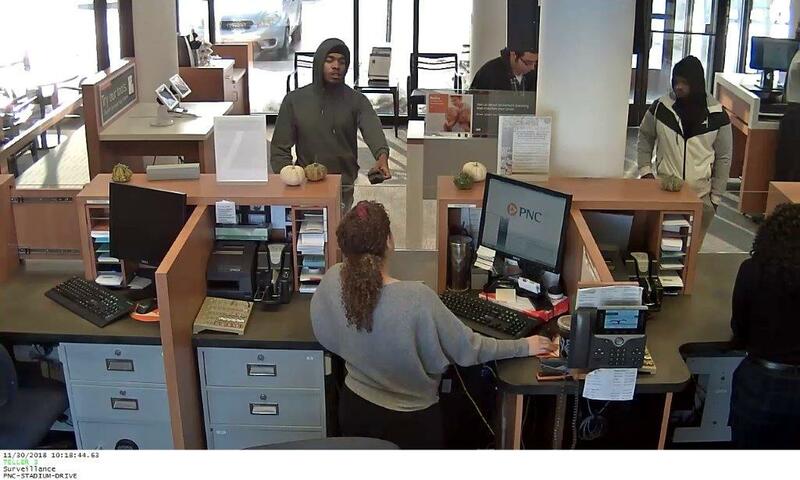 Bank Robbed by Two Males on Stadium Dr.
Kalamazoo, MI: On November 30, 2018, Kalamazoo Public Safety responded to the 4300 block of Stadium Dr, PNC Bank, on a report of a Robbery in progress. The employees advised two African American males entered the bank at approximately 1030am, displaying small caliber handguns, and demanding money. 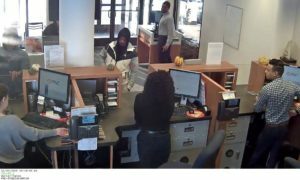 One suspect, taller, wearing a dark sweat suit, jumped the front counter waving his gun, and grabbing money from the open drawers. 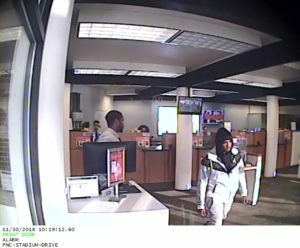 The second male, shorter, with a white jacket on, stayed behind the counter, continuing to demand money. The two suspects fled on foot to the north. Officers arrived on scene shortly after the 911 call. A canine track was initiated, and worked its way up to the area of Debbie Ln. 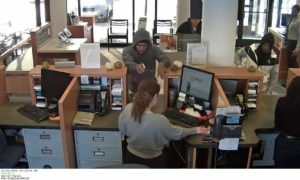 No injuries were reported during this robbery. An unknown amount of cash was taken. The suspects are still be sought by authorities. Kalamazoo Public Safety Patrol, Criminal Investigations Division, and Forensic Lab are working in conjunction with the FBI in attempts to identify the suspects in this case. Attached are four photos showing the suspects inside the bank during the robbery. Anyone with information regarding this incident is asked to contact Kalamazoo Public Safety at 269-337-8139, or Silent Observer at 269-343-2100. Kalamazoo, Michigan: On Monday, November 19, 2018, at approximately 12:15 p.m. Officers from Kalamazoo Public Safety were talking to citizens in the 600 block of Douglas Ave. A vehicle, attempting to avoid another vehicle, went over the curb and struck an officer who was walking on the sidewalk. Other officers who were nearby immediately began first aid on the injured officer. Officers were able to speak with drivers of both vehicles. Speed and alcohol do not appear to be factors in this crash. The officer was transported to a hospital where he is being treated for his injuries. KDPS conducted a crash investigation related to this incident. A press conference will be held at 3:30 pm at Kalamazoo Department Public Safety Headquarters. On 11/16/18, around 3:20pm, a citizen driving in the area of Emerald Drive and Miller Road observed a male physically assaulting a female. The citizen stopped and exited their vehicle with the intent of intervening on the assault. The suspect quickly turned his aggression toward the citizen while pulling out a knife and striking the citizen in the face with his fist. The male suspect then entered the citizens’ vehicle and attempted to drive away, however, the citizen was able to regain control of the vehicle. The citizen only suffered minor injuries from this incident. The male suspect fled the scene on foot to the north and many Kalamazoo Public Safely Officers quickly responded to the area. A police K9 conducted a track for the suspect; however, at the time of this report he could not be located. The male suspect is described as a white male, approximately 35-45 years old, about 5’10”, bald head with an unshaven face wearing a camouflage colored jacket, blue jeans and black boots. The female he was reportedly assaulting was a white female wearing all blue and carrying a black backpack.